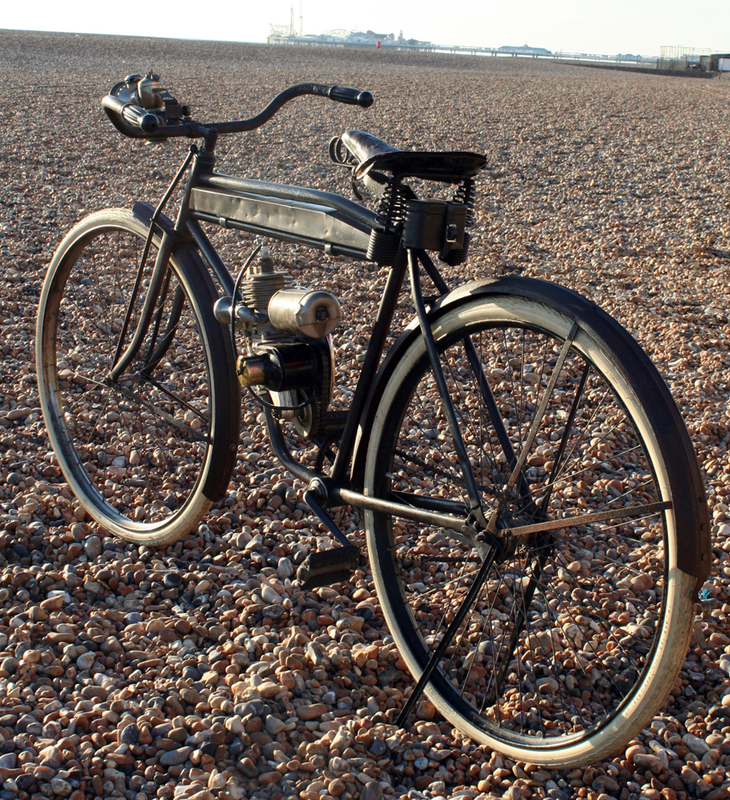 I love researching obscure cycle manufacturing companies as much as restoring the machines. 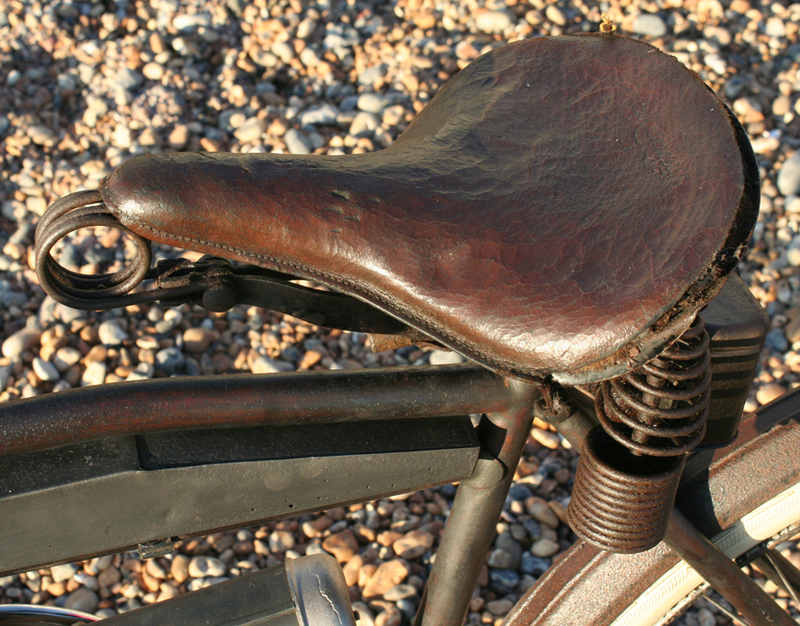 In restoration, it’s important to adhere to original specifications. However, when you’re restoring full-time, there’s always an urge to be more creative with some of the projects. 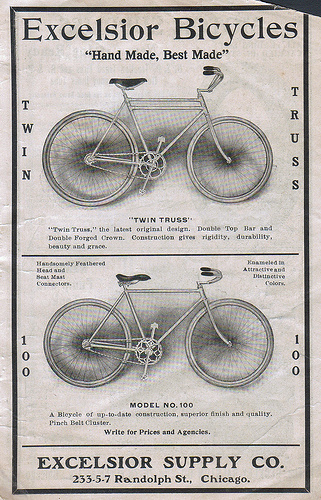 Obviously folks did not rigidly stick to what a catalogue specified back in the day; and bikes were subsequently updated too. 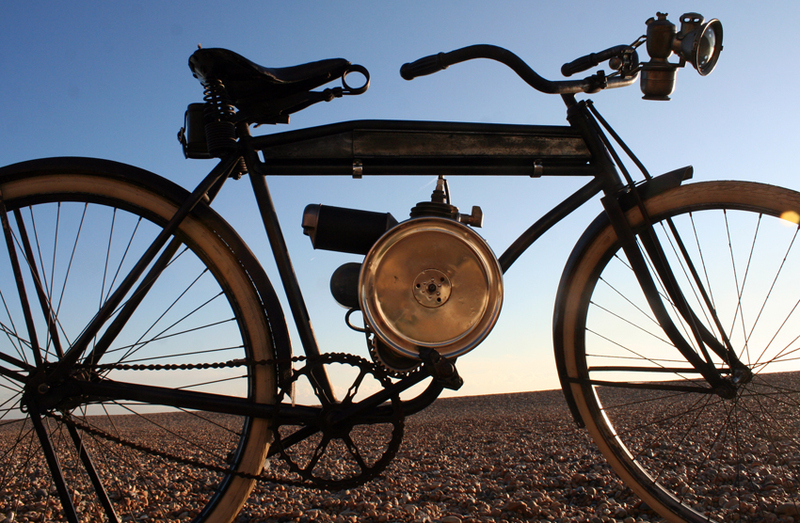 Cyclemotor riders needed to be innovative as machines built by smaller companies were not fully tested. But in the 21st century we expect restorations to reflect the state of the art in the year of production only. 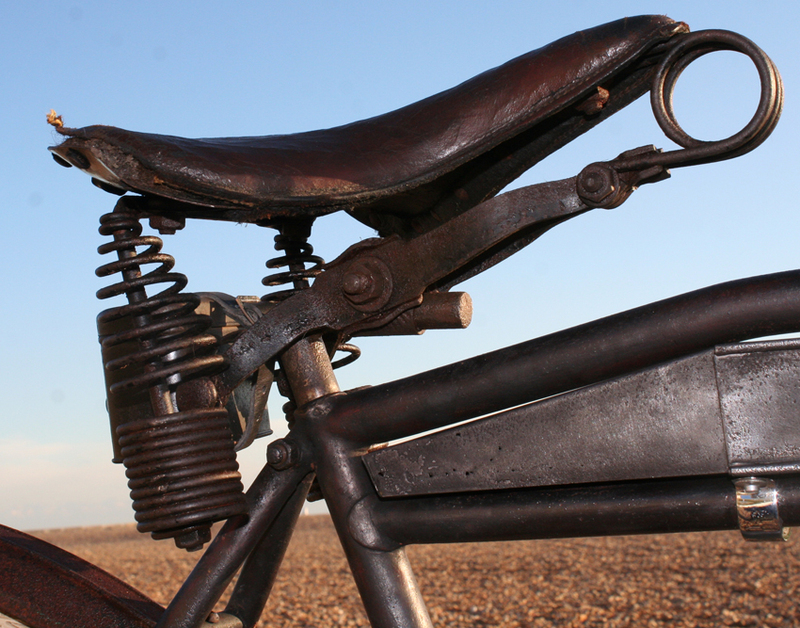 Creating a bespoke machine by adding a cyclemotor to a bicycle allows additional creativity without deviating from originality. I had a lot of fun with this one in particular. 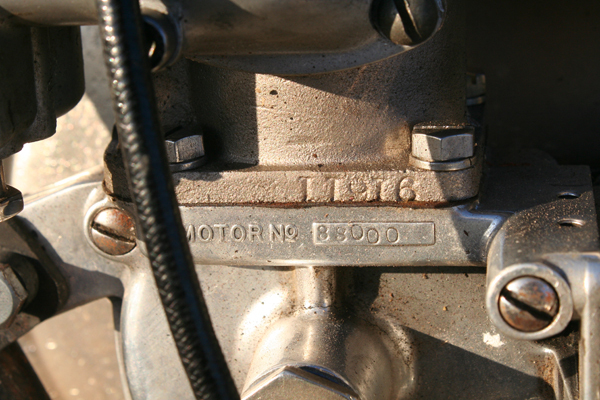 Some time later, I had the opportunity to obtain a 1922 Cyclemotor engine. Of course, I jumped. 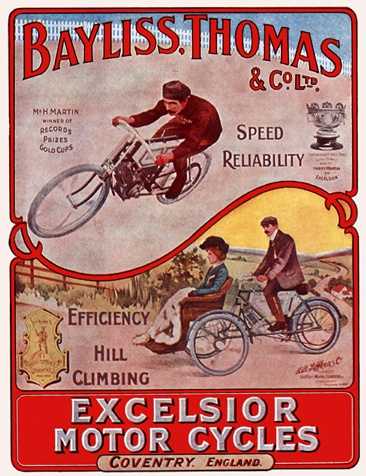 Remembering the advert, I thought it would be fun to find an Excelsior bicycle as a recipient for the engine. 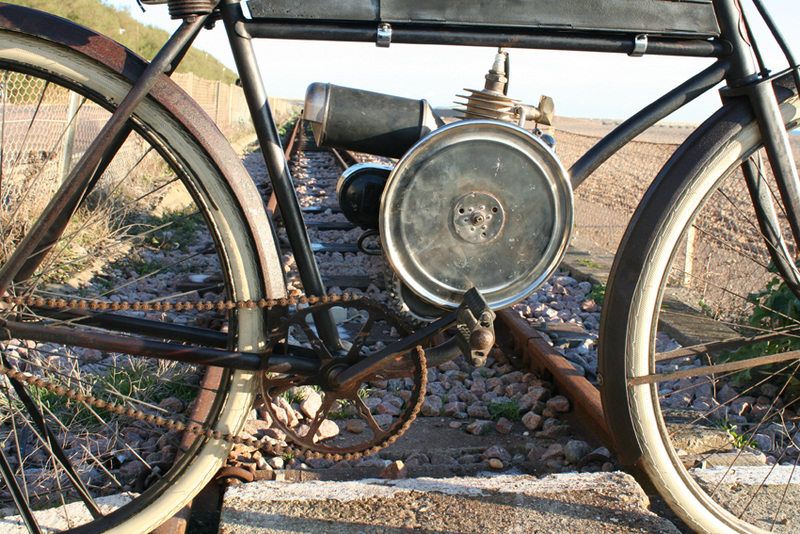 That’s part of the enjoyment of cycle-attachment engines: just as customers did all those years ago, you can choose your own combination of engine and bicycle. Eventually, I found this one in the USA requiring some work, so I grabbed it too. 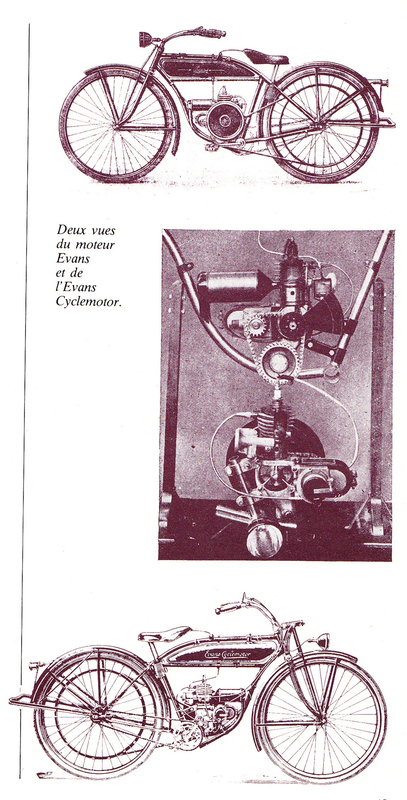 The Cyclemotor engine is mostly complete. 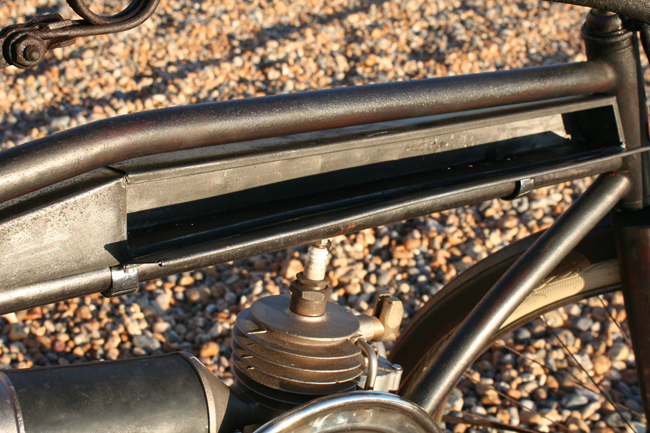 A dummy rim to clip onto the rear wheel would be needed (one from a Whizzer would be the easiest option). 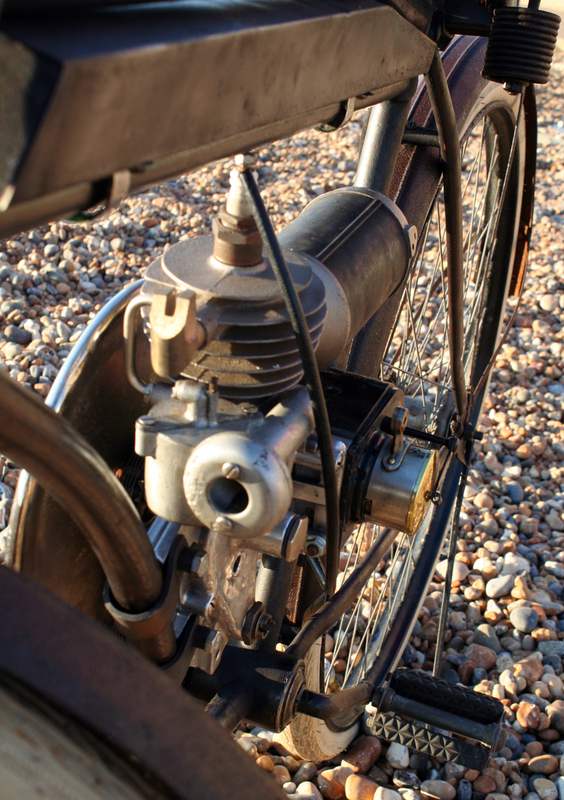 When we offered the engine up into the bike, we put it in back to front and I forgot to turn it round for these photos. 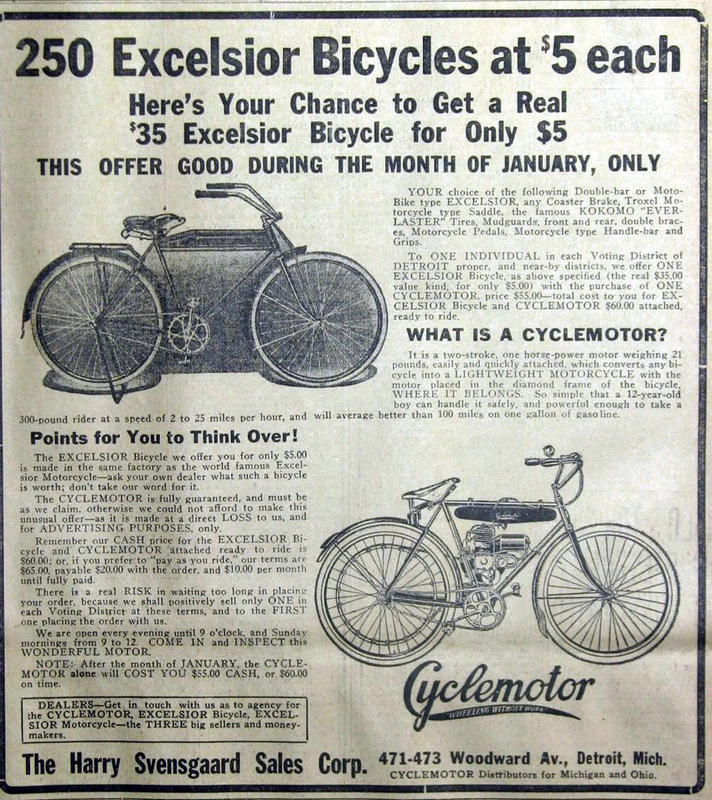 Like so many fine details in the history of cycle manufacture, the reasons are now lost in time, but it would appear that after Arnold Schwinn took over Excelsior and moved all production to Chicago (see Excelsior history, below), the Excelsior factory in Michigan City, Indiana was still used to make bicycles, but as an independent company not owned by Schwinn. 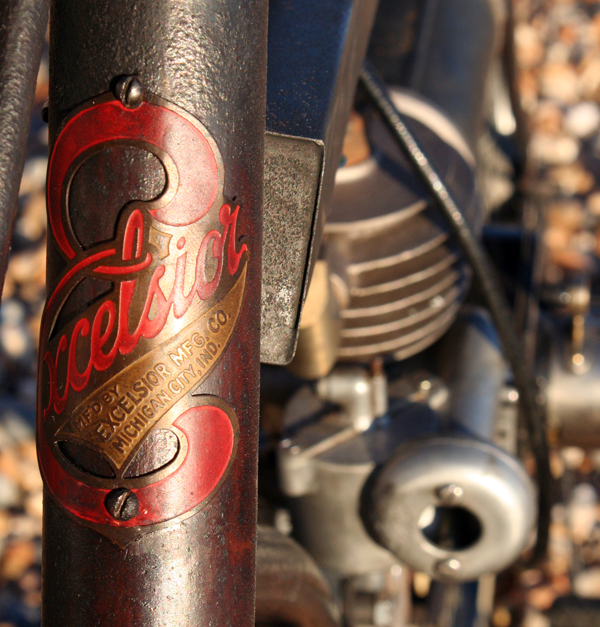 These bicycles were also badged as Excelsior, though they showed the different factory location. 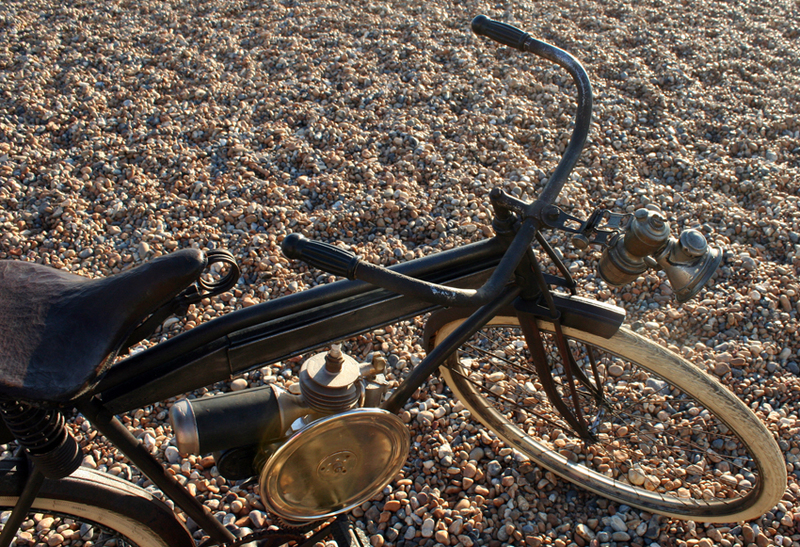 This bicycle is one of these Indiana Excelsiors. 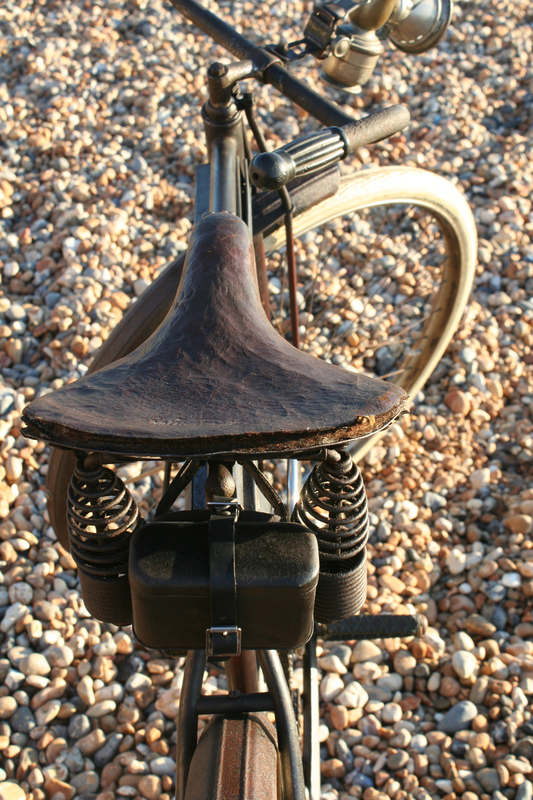 This was my sales blurb when I advertised it for sale on my sales website, www.BuyVintage.co.uk: ‘The bicycle itself is in good rideable condition. 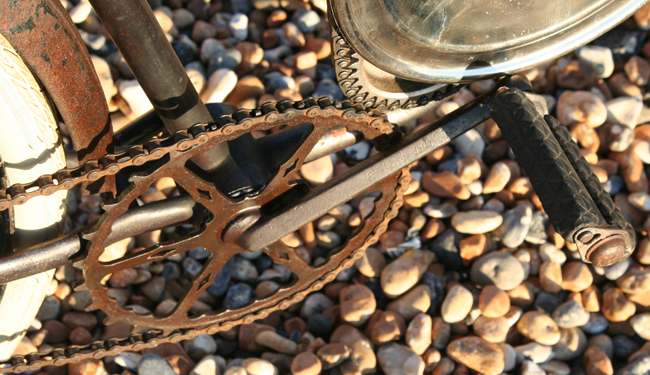 All the bearings have been serviced and everything is greased up. 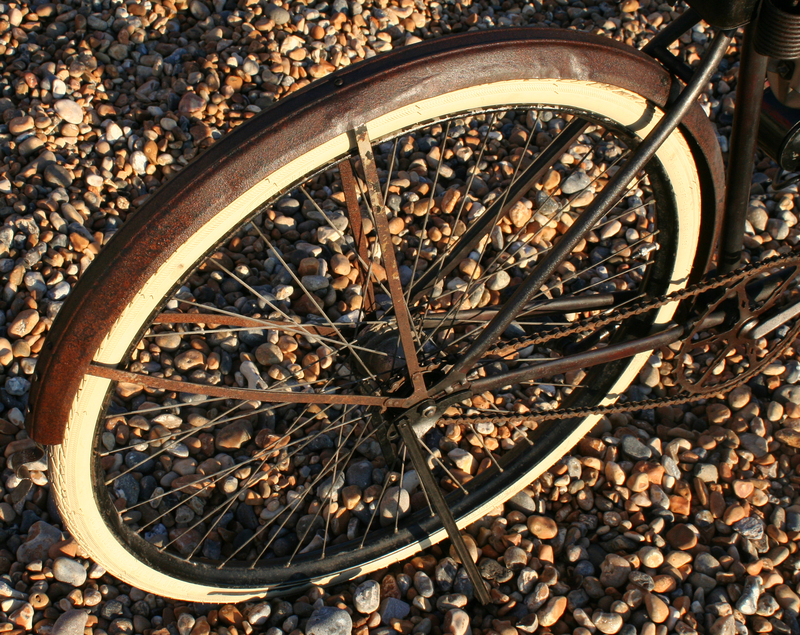 Instead of American wooden wheels requiring tubular tyres, we fitted a rare c1910 pair of metal British wheels with coaster hub (probably an Eadie) and new 28 x 1 1/2 white pneumatic tyres. 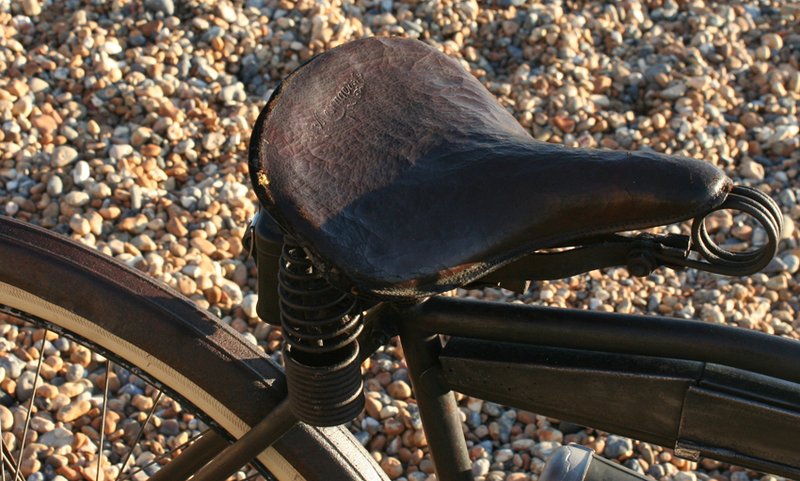 The Messenger saddle is excellent. It’s cosmetically unrestored. 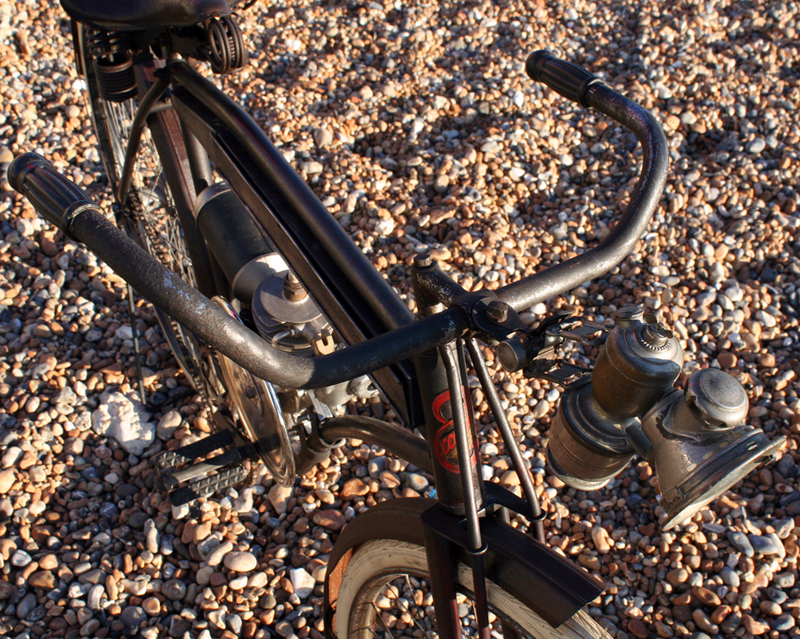 Like the majority of true vintage bicycle enthusiasts, we don’t like shiny over-restored bicycles.’ I sold it at an autojumble, to a chap with a 1915 Excelsior V-Twin motorcycle. 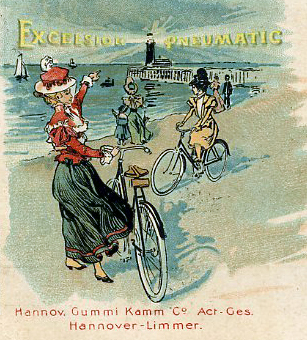 Excelsior started out, in 1876, as the Excelsior Supply Co, making bicycle components, to be followed by the manufacture of complete bicycles. 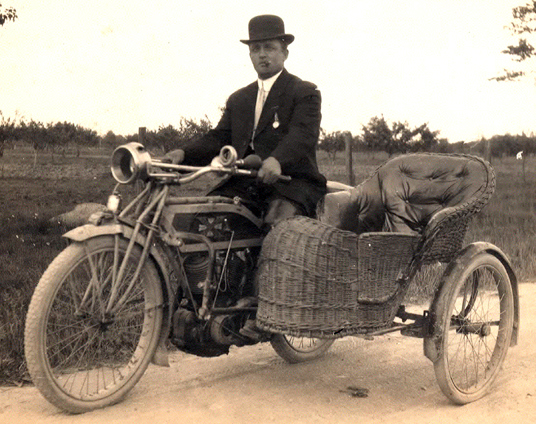 When the company built its first motorcycle in 1905 (below), they had a head-start over their competitors both because of their experience and because they could depend their own parts. 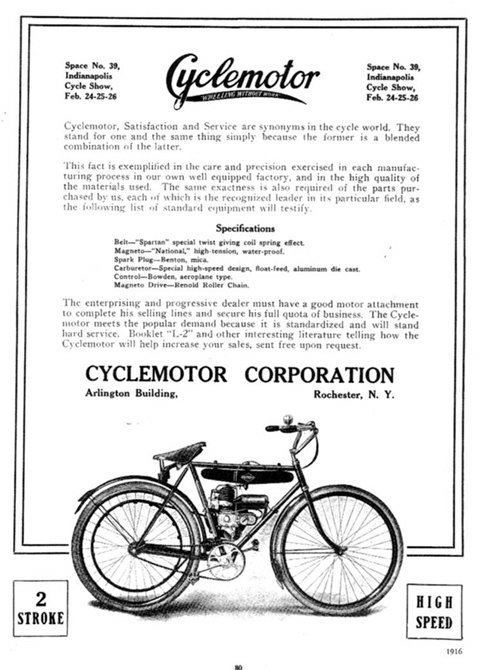 The company soon became one of the leading motorcycle manufacturers, and was approached by Schwinn, who realized that even if he started his own motorcycle business, he’d be hard put to compete with companies like Excelsior in this growing market. 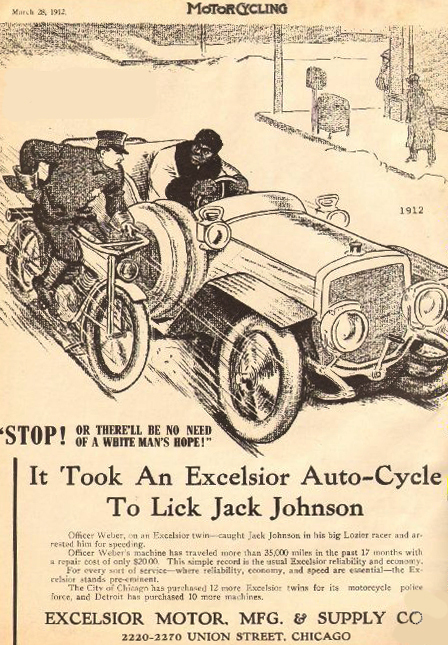 He eventually bought Excelsior on 1st February 1912 for half a million dollars, and Excelsior moved to a new factory at Union Ave, Chicago. 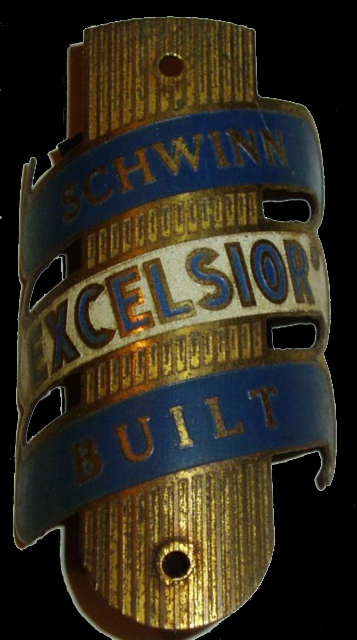 The acquisition of the Excelsior Motor and Manufacturing Company was a perfect way for Schwinn to expand and diversify his business. 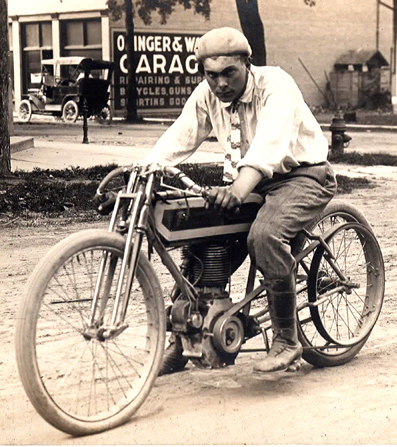 And the increased investment allowed Excelsior to expand still further, in 1914 moving into the world’s largest motorcycle factory at 3703 Cortland St, Chicago, a state-of-the-art facility that even had a test track on its roof. 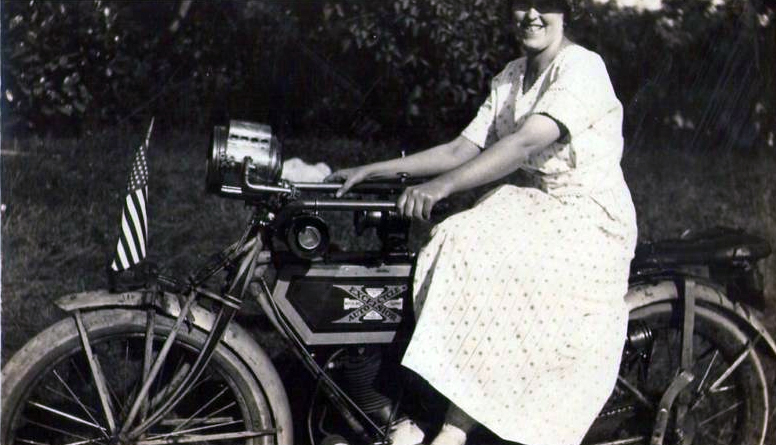 Henderson started making motorycles in 1912, and soon became Excelsior’s main competitor. 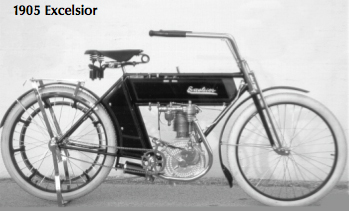 The Henderson Four was in Schwinn’s sights as a stable mate for the Excelsior Super-X and, by the end of 1917, Henderson was acquired by Excelsior and had also moved to the Cortland Street factory. 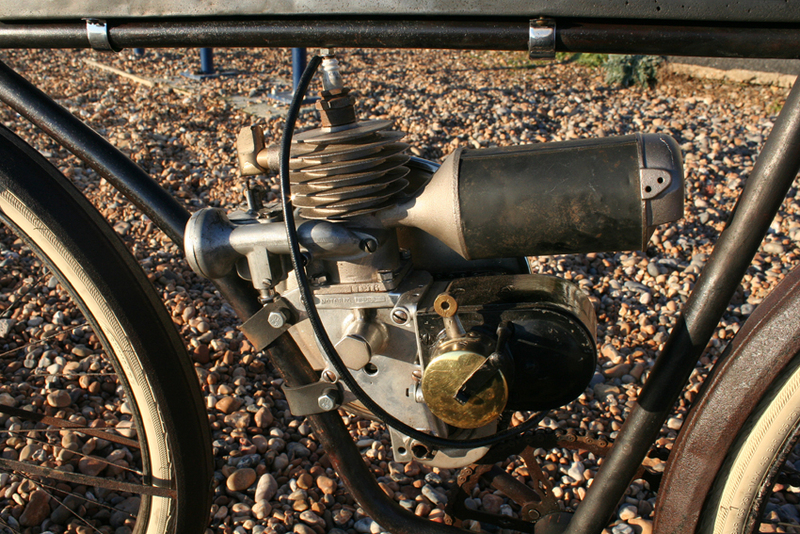 Below you can see a 1917 Henderson Inline Four Model G that I sold last year (the final model made before the takeover). 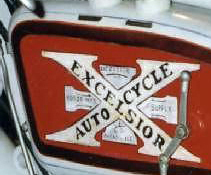 To avoid confusion with the British company of the same name, American Excelsior used the name ‘Excelsior-X.’ You can see the ‘X’ logo below on the motorcycle’s tank. 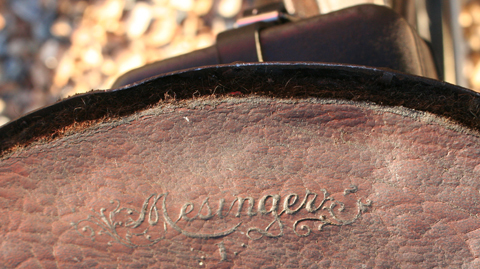 After 1917, Hendersons were badged in a similar fashion. 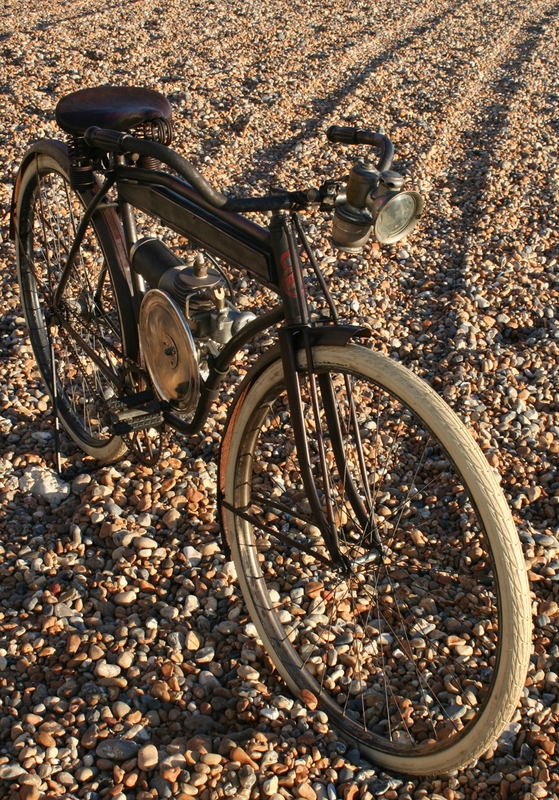 The Excelsior was used during WW1. 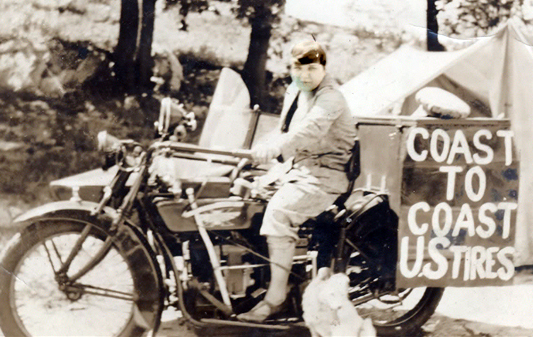 The Wall Street Crash badly affected motorcycle sales. In the summer of 1931, Schwinn called his department heads together for a meeting at Excelsior. 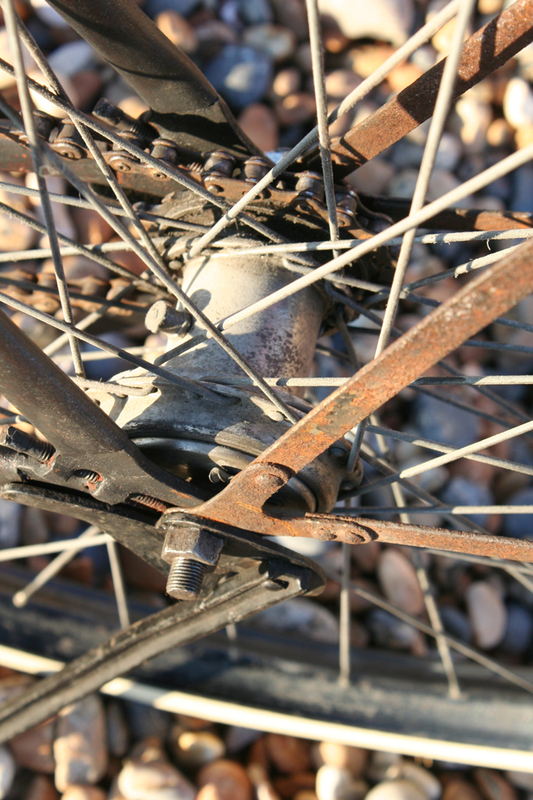 He bluntly told them, with no prior indication, ‘Gentlemen, today we stop.’ Schwinn felt that the Depression could easily continue for eight years, and even worsen. 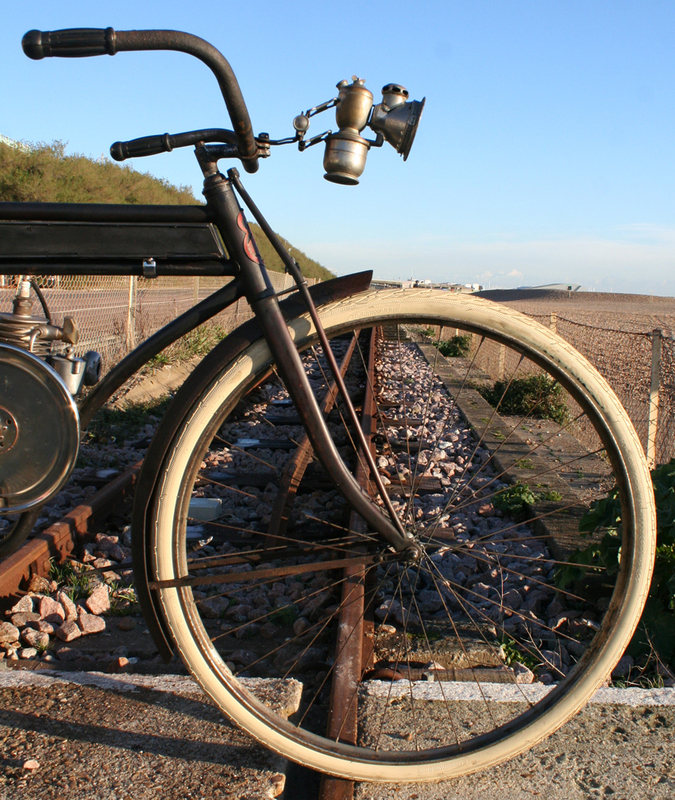 Despite of the full order book, he had chosen to pare back his business commitments to its core business, bicycle manufacture. 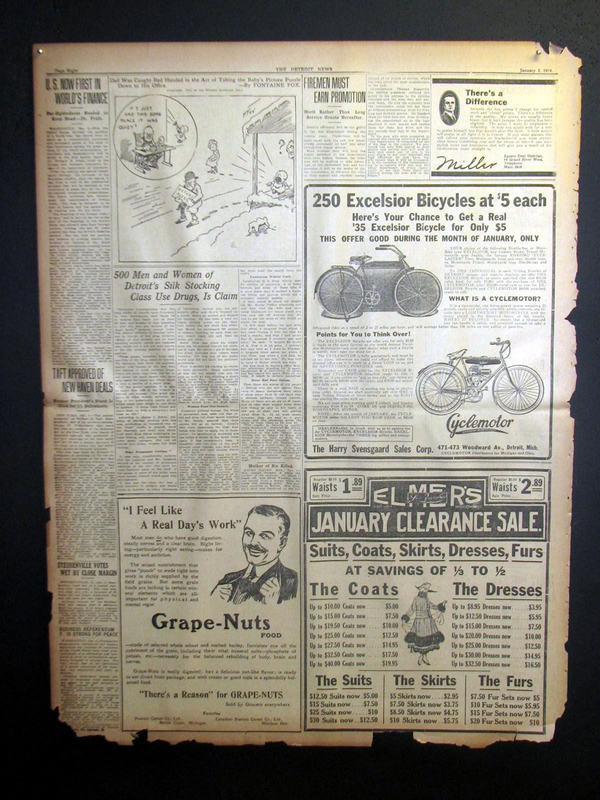 By September 1931 it was all over for Excelsior. 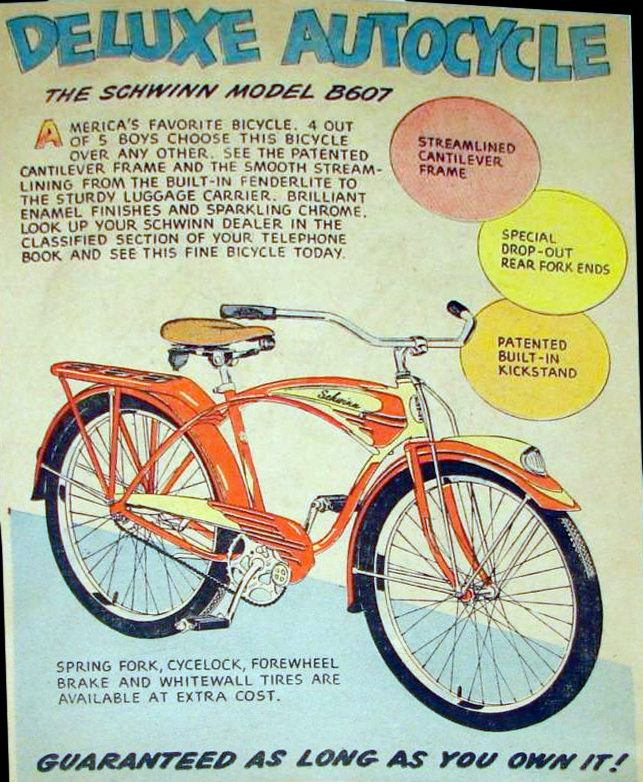 But the name continued after 1931, as Schwinn used many famous names for its various bicycle models over the years. 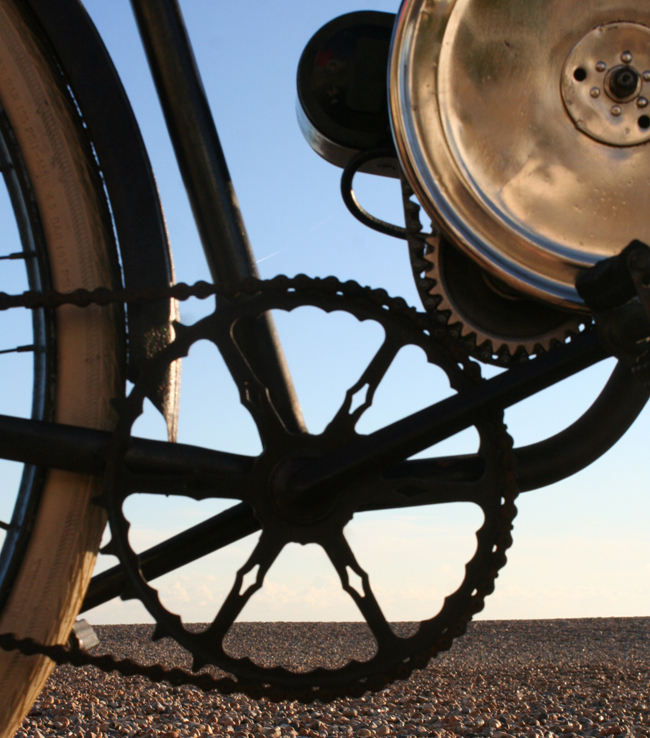 The Schwinn Excelsior and the Schwinn Autocycle both became well-known bicycles. 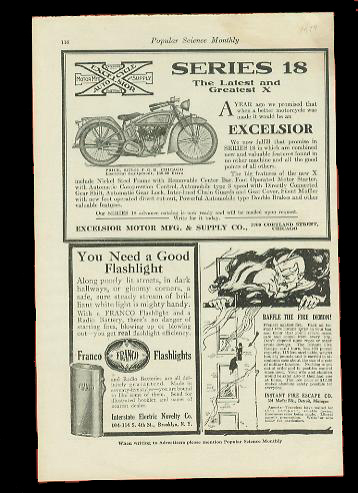 In British vintage motorcycle circles, it amuses us to see the name ‘Excelsior Auto-cycle’ describing a large motorcycle, as we’re more familiar with this name attached to a 98cc British machine, as seen in the following section. 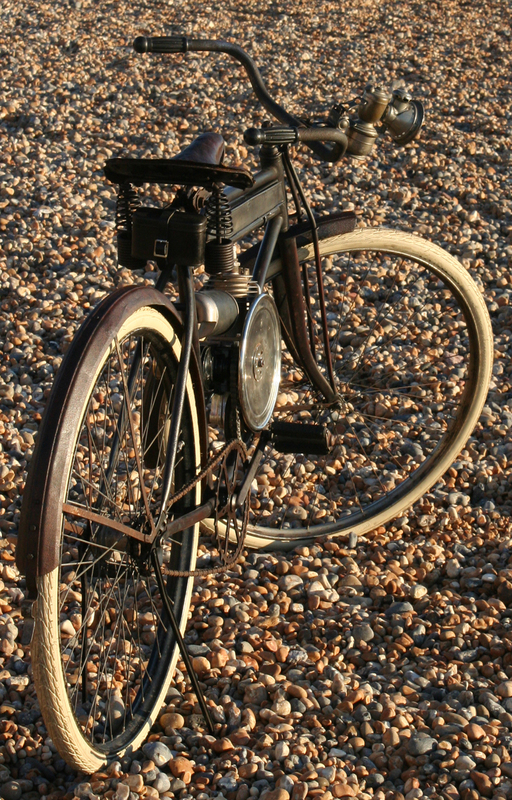 I sold my friend’s 1914 Excelsior pictured above and below, at Beaulieu Autojumble in September 2011. It’s being restored by the new owner. 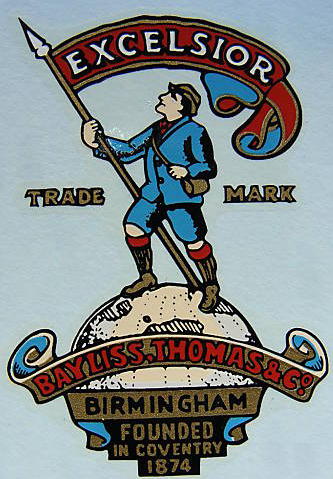 Bayliss, Thomas & Co, established in 1874, were well-known makers of bicycles and tricycles at the Excelsior Works in Lower Ford Street, Coventry. 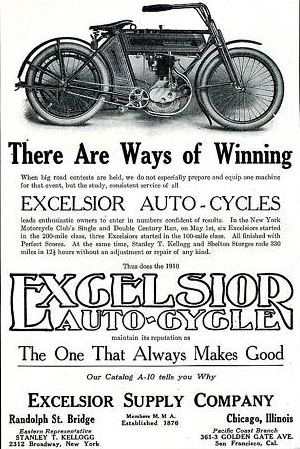 Their first machine, an ordinary, was called the Excelsior (one of several trademarks used by the company). 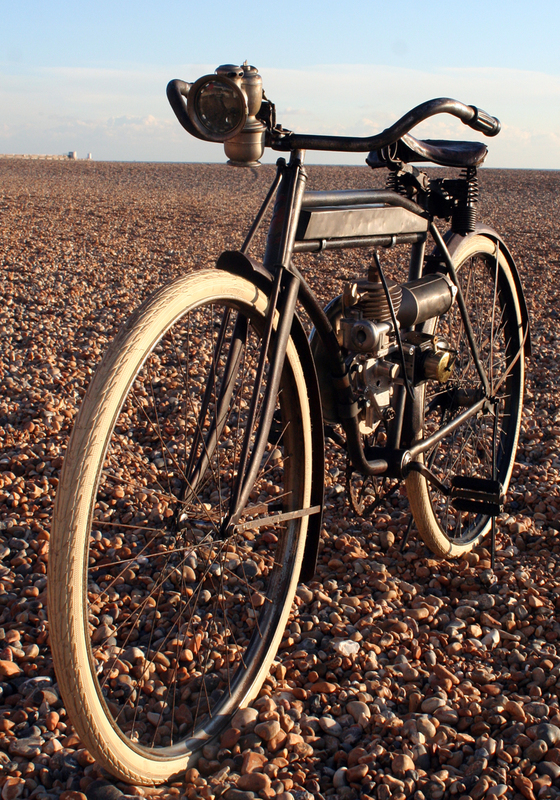 They became Britain’s first motorcycle manufacturer, producing a motor-bicycle in 1896. 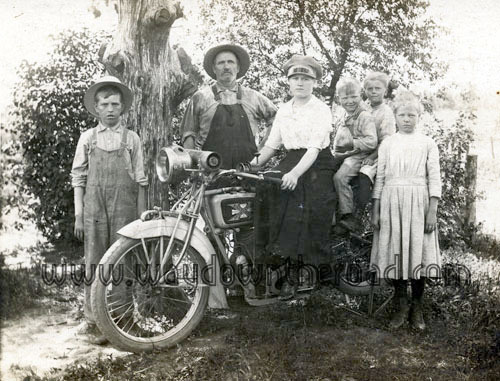 The company name Excelsior Motor Cycle Co was registered in 1909. When the company was taken over in 1919, it moved to Kings Road, Tyseley, Birmingham 11. 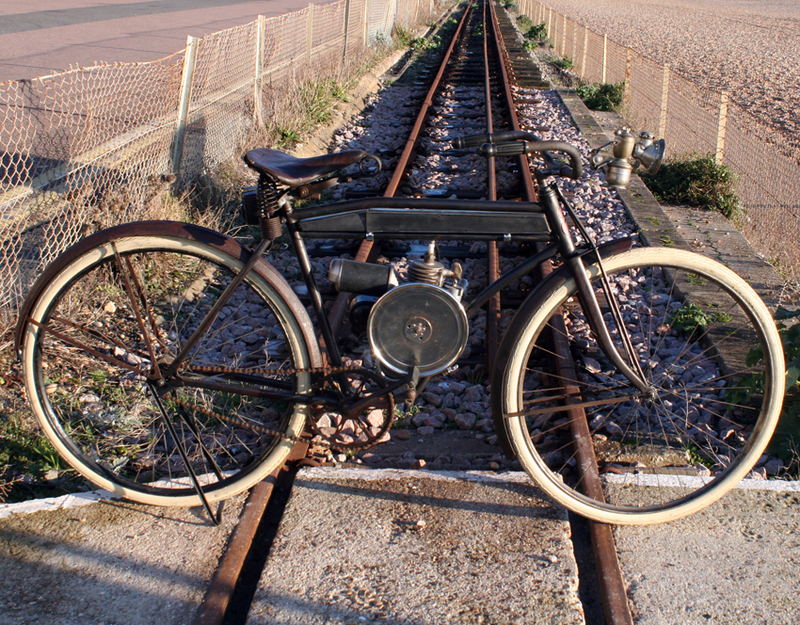 The name Bayliss, Thomas & Co was still used for exports to avoid confusion with the German and American Excelsior; there was also a Belgian car called the Excelsior. 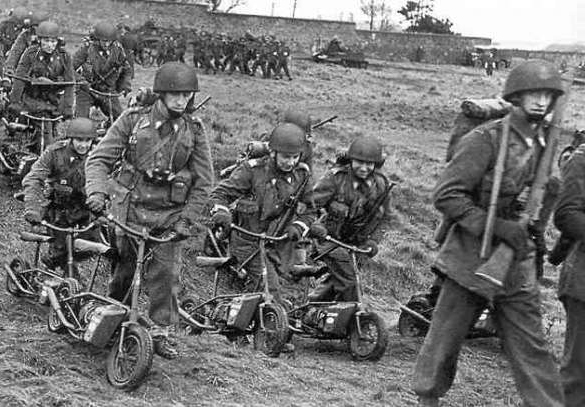 During WW2 Excelsior supplied the Welbike (below) which, postwar, became the Corgi. 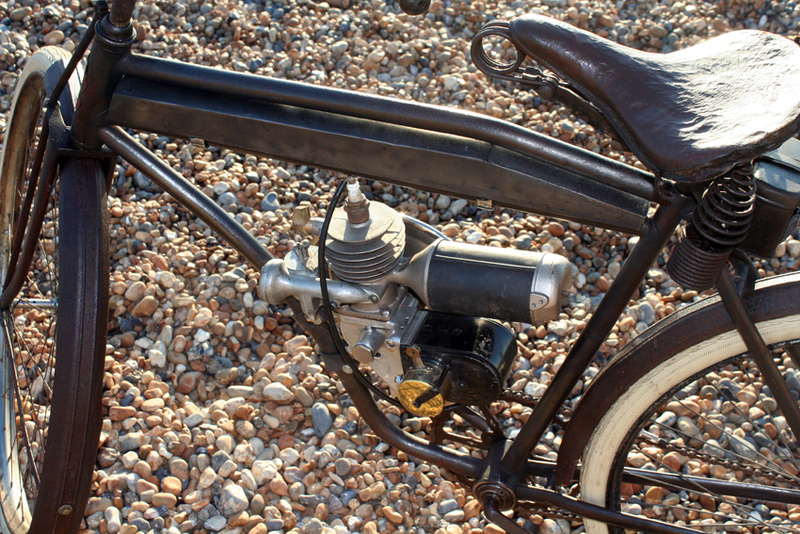 Below is a 1955 Excelsior Autobyk autocycle that I sold a few years ago. 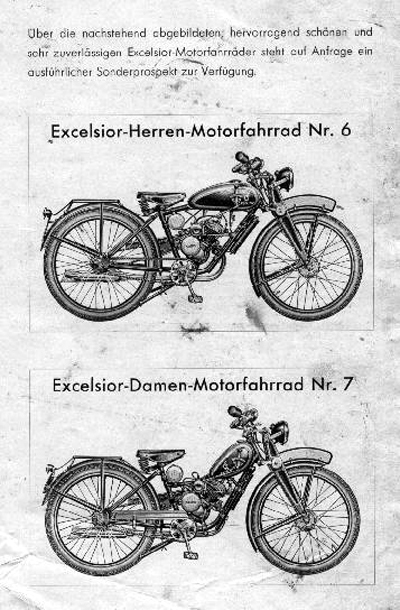 Below, to compare with the British Excelsior Autobyk, is an advert for the German equivalent of the autocycle, a 1939 Excelsior Herrenrad and Damenrad, with a 98cc Fichtel & Sachs engine. The ‘tank’ is actually a toolbox. You can see the flap open below. 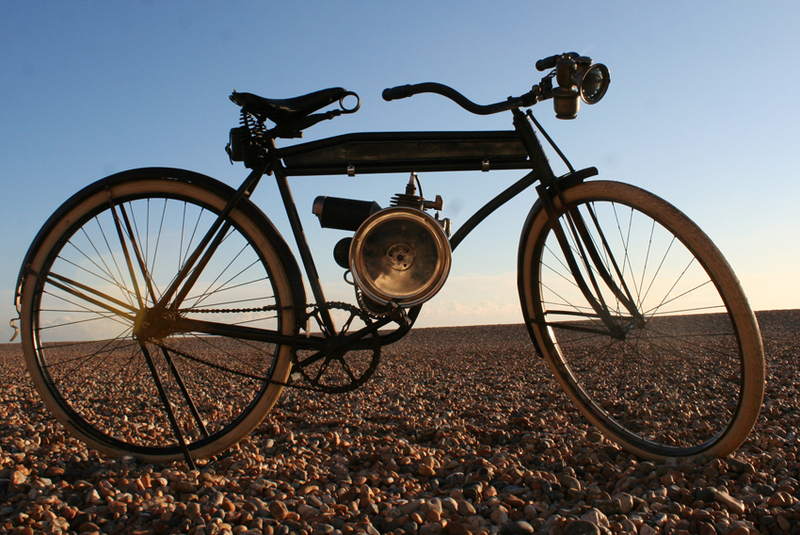 The 119cc CYCLEMOTOR engine was manufactured by the CycleMotor Corporation between 1919 and 1924, both as a complete machine (with the bicycle built by Evans) and as a separate cycle-attachment engine. Various models were exported to Europe. 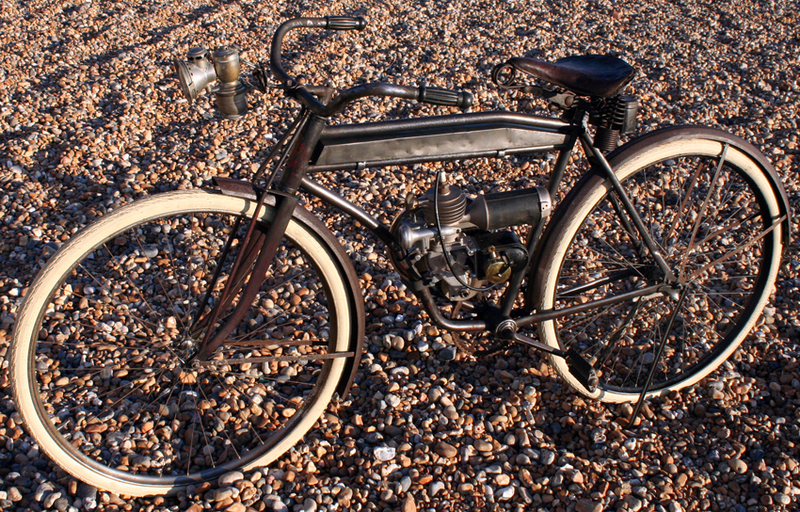 After CycleMotor ceased production around 1924, manufacture passed to Stock-Motorpflug A.G in Berlin, who made them until 1933 under license and sold them under the name ‘Stock.’ Tax records from Berlin show Stock was only in business from 1924 – 1933. 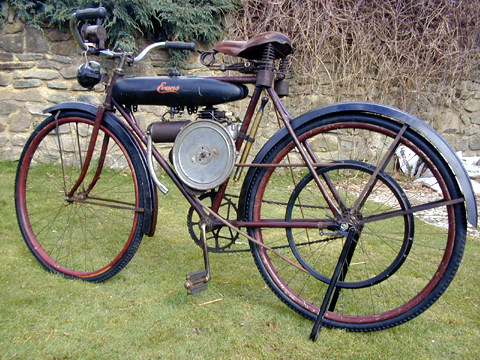 Later models had a 3hp engine with shaft drive. 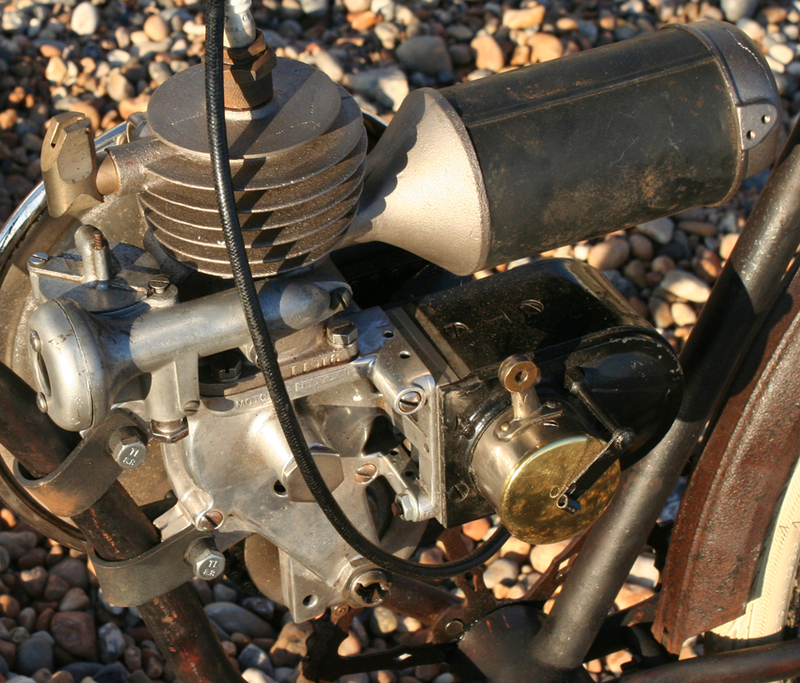 My friend had an Evans Power-Cycle with the same engine (below) that I advertised for him on my sales website www.BuyVintage.co.uk. It ended up in Austria. 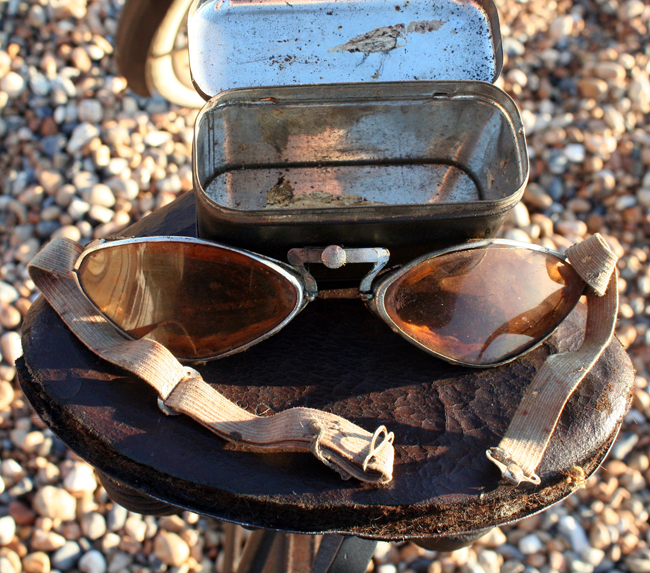 The box under the rear of the saddle houses a pair of period goggles. 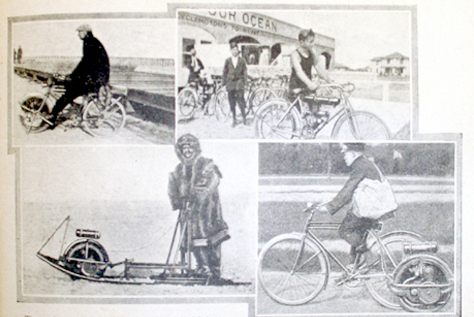 Below: a Cyclemotor pictured at the beach in a period magazine.